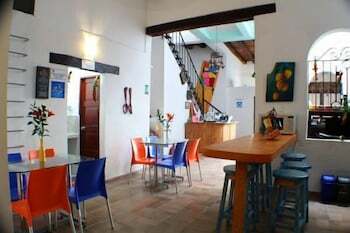 With a stay at Mi Llave Hostels Cartagena in Cartagena (Cartagena Walled City), you'll be a 3-minute drive from Puerta del Reloj and 5 minutes from San Felipe de Barajas Castle. Featured amenities include a computer station and a 24-hour front desk. With a stay at Santo Bambu Hotel Campestre in Pereira, you'll be 7.4 mi (11.8 km) from Pereira Botanical Garden and 7.6 mi (12.2 km) from Museum of Art. Free self parking is available onsite. When you stay at Cabañas Venecia in Covenas, you'll be on the beach and steps from Puerto Viejo Beach. The front desk is staffed during limited hours. Free self parking is available onsite. With a stay at Hotel Boquilla Camping in Cartagena (La Boquilla), you'll be a 3-minute drive from La Boquilla Beach and 8 minutes from Marbella Beach. Free self parking is available onsite. With a stay at On Vacation Sea Horse All-Inclusive in San Andres, you'll be within a 5-minute drive of Rocky Cay and San Luis Beach. Free self parking is available onsite. When you stay at Hotel Porta Di Mare in San Andres, you'll be near the beach and 6 minutes by car from El Hoyo Soplador Geyser. The front desk is staffed during limited hours.